INDUSTRY.co.id - Jakarta, The weakening of the Rupiah against the US Dollar (US) had touched the level of Rp14. 200 per USD. This condition is certainly very affect the industrial sector of Indonesia. 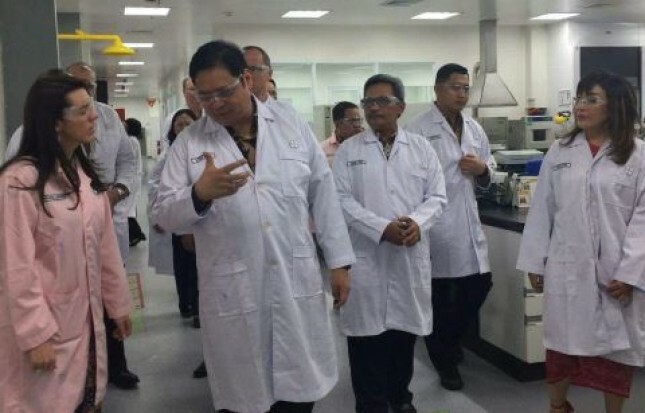 The Minister of Industry, Airlangga Hartarto, said that the pharmaceutical industry was hardest hit by the US dollar exchange rate of Rp 14,200. The reason, Minister added, the industry is partly imported raw materials using US dollars, while sold with dollars in the domestic market. "There are many sectors including pharmaceuticals, pharmaceutical industry is a problem because he is part of imported raw materials selling Rupiah," said Airlangga in Jakarta (22/5/2018). He added that until now the national pharmaceutical industry is still very dependent on imported raw materials because it is influenced by a number of things. "Yes, of course there is a connection with the intellectual property right (intellectual property rights), then if we talk to bio chemical there is a matter with the sample, how the sample can be exported its imports easier," he continued. However, he added, for some large medium-scale companies whose earnings are in US dollars, the Rupiah pressure has no significant effect. Because, they have implemented a natural hedging scheme, where they still import raw materials but simultaneously receive income in US dollars. "The industry is a large medium-sized average that the loan in USD so of course the decline of the Rupiah did not give a big effect," he explained. On the other hand, this condition actually provides a blessing for Small and Medium Enterprises (IKM) which the majority of its products use local components, while their market share is mostly exported. Airlangga stressed, the most important for the industrial sector is the stability of the Rupiah exchange rate. "Therefore, the industrial sector needs the assumption of Rupiah to maintain its budget allocation and financial performance of the company," he explained. The government also seeks to increase local raw materials for the pharmaceutical industry so as not to over-depend on imports. Thus when the US dollar rises, he is not too affected. "Therefore the Ministry of Industry is talking for local content so more local content will greatly help the industry's competitiveness," he said. The pharmaceutical industry, called Airlangga, is just one of many industrial sectors affected by the strengthening of the US dollar. "Most of the raw materials are domestic helpers, most of which are imported raw materials, domestic sales, and the raw materials are dollars, selling rupiah," Airlangga said.